Everything Nice – Oh Sew Kat! Gingham Peasant Dress Outfit Tutorial for Julie Albright- A BeForever Pattern Hack! I’m really enjoying sewing for Julie Albright, the BeForever character from 1974. I think I’m attracted to her collection because I was seven years old in 1974 and I had very similar things- like her purple coat (mine was blue) and the sneaker skates (mine were bright yellow with orange stripes). 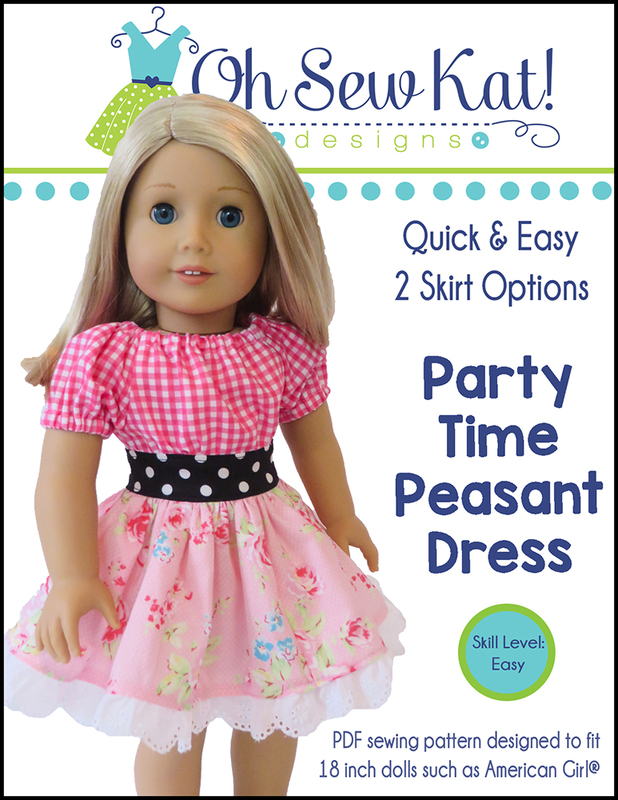 When I saw THIS PIN, I just knew that this peasant style outfit would be easy to recreate with Oh Sew Kat! patterns. 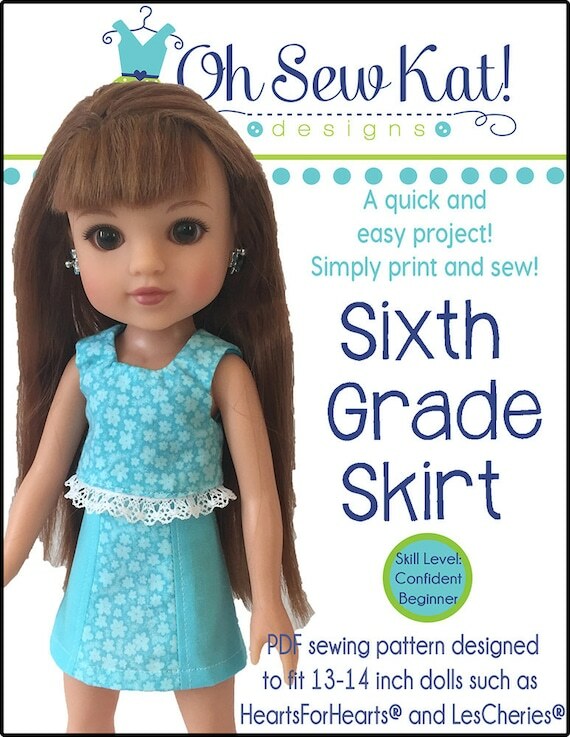 Make a 70s style gingham skirt for your 18 inch Julie doll and her friends. Click here to see other outfits I’ve sewn for Julie. The top is simply the Playtime Peasant Top, sewn in white with long sleeves. For the skirt, I used the overskirt that comes in the Sugar n Spice and Everything Nice bundle. I cut the gingham fabric skirt longer by 4 1/2 inches, but didn’t make any other changes. Add a little lace at the bottom, and ta da! A perfect, pretty bell skirt! Add a red or gingham ribbon to complete the look. This outfit will be perfect for the Christmas holidays! Find the patterns HERE. Find more fashions for Julie (all made with Oh Sew Kat! patterns!) here and here. Step it Up! 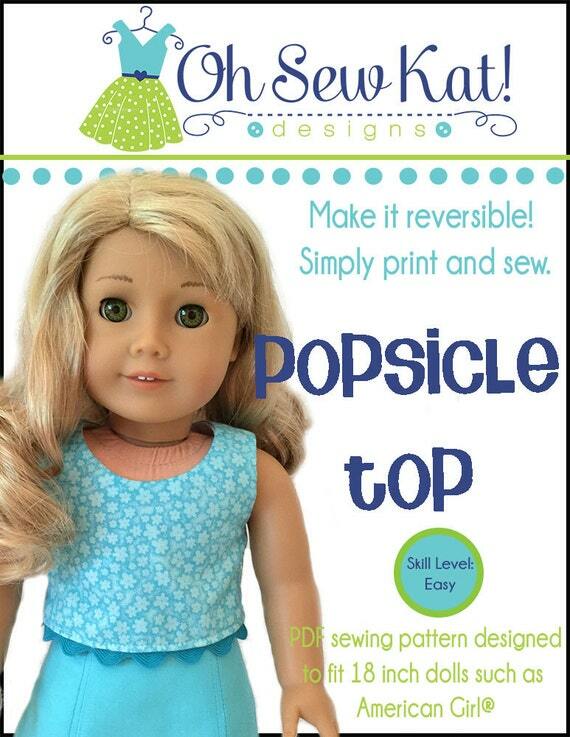 Series: Make a 50s Style Sunshine Overskirt Dress for Maryellen Larkin- A BeForever Doll Pattern Hack! These outfits came about completely by accident. They don’t even need a tutorial or pattern hack. I simply used pieces from two different patterns together to make a new outfit. I was making a doll skirt from my Everything Nice pattern. 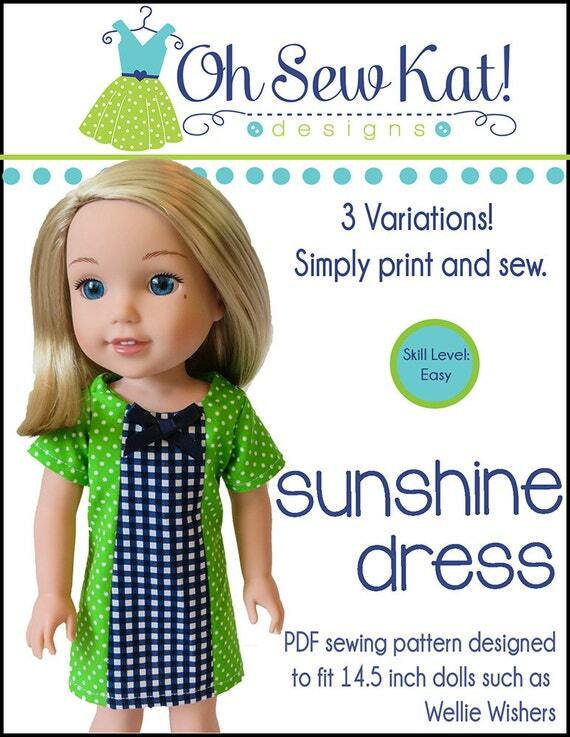 (The Everything Nice pattern is the accessory pattern that is sold bundled with the Sugar n Spice dress.) . It is a quick little skirt, attached to the waistband, with an open back. 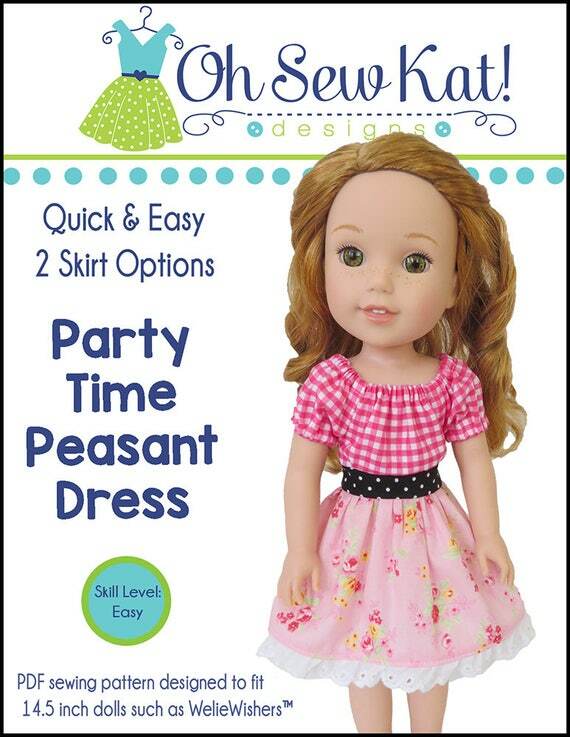 It was designed to give “dress up options” to the princess themed Sugar n Spice Dress. In order to check my hook and loop tape placement, I grabbed the closest doll. It was Melody, and she was wearing a Sunshine Dress I made for THIS post. The dress seemed tight enough for my test, so I did not remove it. As I stood back to check the skirt fit, I realized that by simply using two of my own patterns, I could create a similar look to Melody’s fancy dress or the popular overskirt fashions of the late 50s and early 60s. I went right to Pinterest for some inspiration and found this pin, and also this pin, and this pin. Next I went to my fabric stash- and found some navy fabric to match one Sunshine Dress I’d already made…and chose some creamy, dreamy roses fabric for the other one. 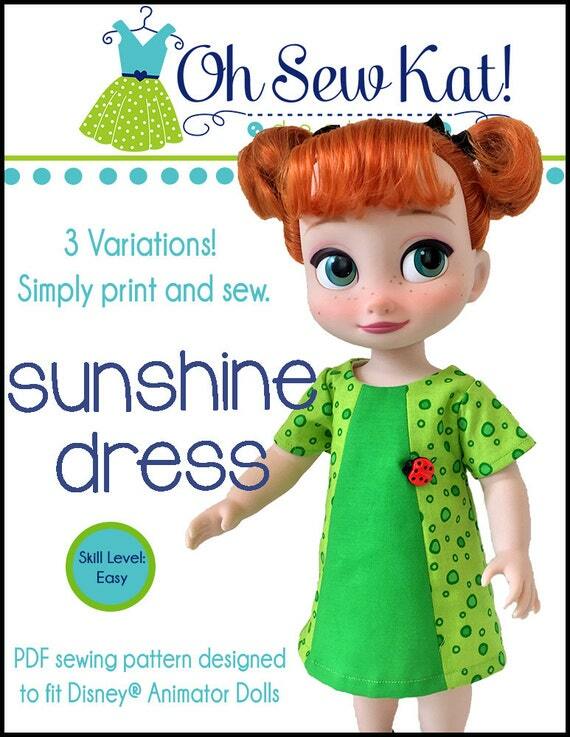 This dress is the Sunshine Dress sewn with the princess seams option. The Everything Nice overskirt fits perfectly over it- open it in the front or in the back! Easy peasy lemon squeezy! Find the Sunshine Dress HERE. 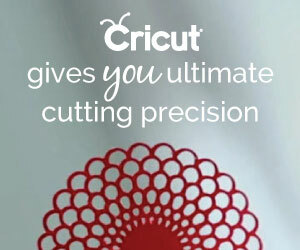 What other patterns can be used together to provide more value for your time sewing and money spent? Share in the comments below. Make a 50s or 60s inspired dress for your dolls today by checking out these other pattern hacks here and here! Here are some more pretty Easter dresses to inspire your sewing as we get ready to leave March behind and head right into April and spring!! Soft pastels and bunnies are in season! 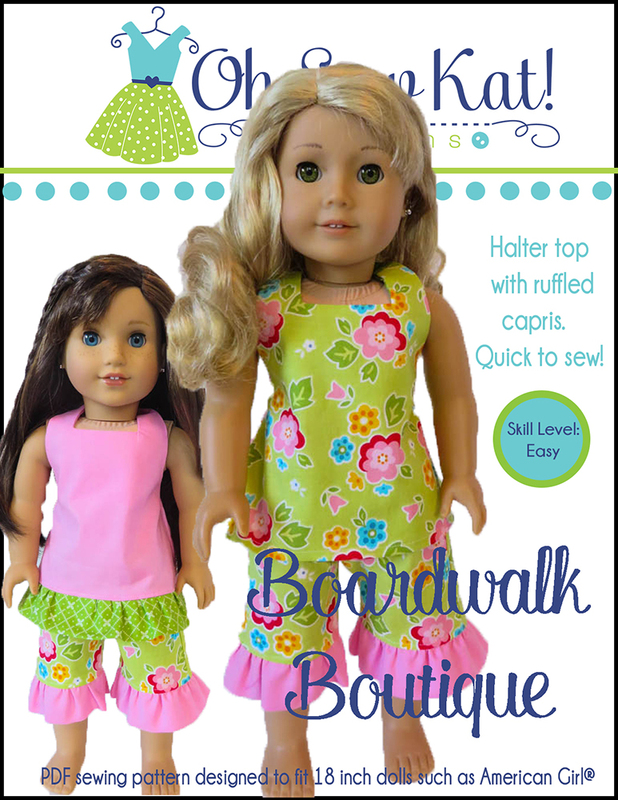 These dresses were made using the Sugar n Spice pattern. Find it in three sizes on Pixie Faire, Etsy, You Can Make This, and also in the iCreateMarketplace. The Sugar n Spice and Everything Nice bundle gives you even more options to dress up your “dress”! Find the Sugar n Spice pattern here. The pink ruffled trim is Strawberry Slush ruffle elastic trim from Stampin’ Up! It’s not attached to Emily’s waist, I just added it on top like a belt and couldn’t really decide which way I liked it better, flipped up or down. It was the perfect color!! 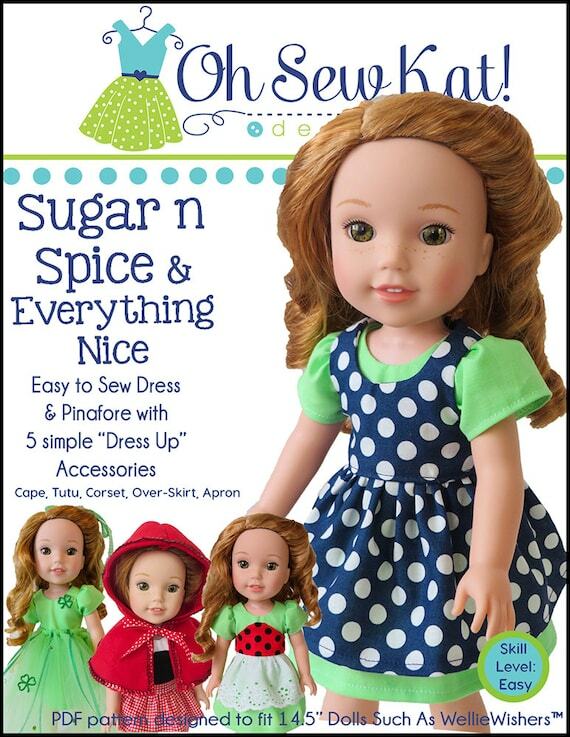 Find the Sugar n Spice PDF Sewing Pattern for Dolls here. 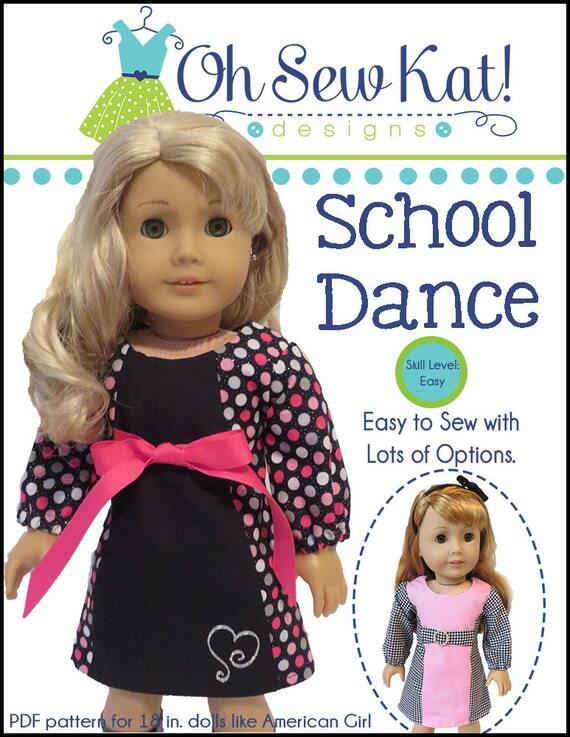 Make Easter dresses for your 18 inch dolls with easy sewing patterns from Oh Sew Kat! This bunny face print is just so much fun!! I wanted to bring out the black face accents, so I chose a black gingham to accent it. I love black and white with pops of color! I had a few different fat quarters that a friend picked up as a surprise for me at Walmart and it was fun to mix and match the prints. At less than $4 for a yard of fabric, you can’t beat the price tag! (See my Valentine dresses also from Walmart fat quarter packs HERE. )My girls are ready for Easter. Are yours? See more ideas to use your Sugar N Spice/Everything Nice pattern HERE!! Wow, is it me or does it feel like Easter is early this year? I was happily sewing shamrocks and then I looked at the calendar! Yep, Easter is in just two weeks!! If we blink, we just might miss it. I wanted to share a little Easter inspiration if you are looking for something to fill a special someone’s Easter basket this year. These dresses were made using the Sugar n Spice pattern. It’s available in three sizes (so far!) on Pixie Faire, Etsy, You Can Make This, and also in the iCreateMarketplace. Each season you can use the same dress- just add a different overskirt!! Isn’t this Henry Glass fabric just perfect for dolls? Here I used the green and yellow dresses. But click HERE to see the Valentine version over a white dress. 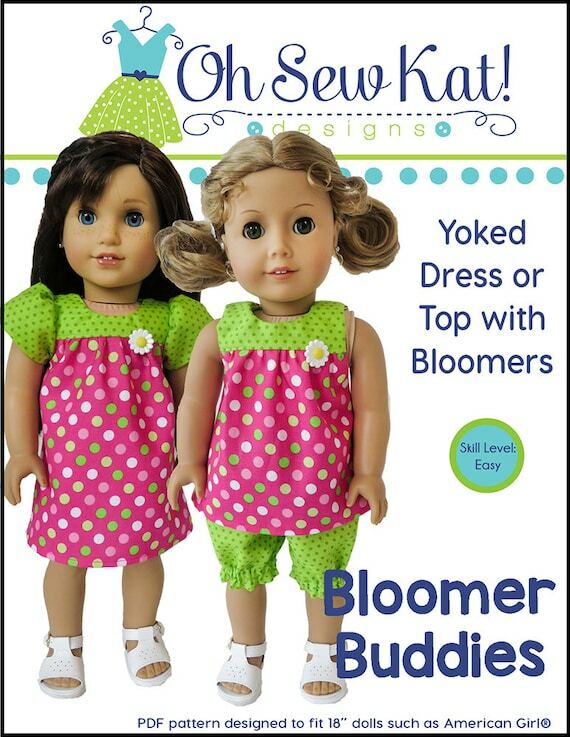 Easter Dresses for Dolls with the Sugar n Spice PDF sewing pattern. Choose a few solid colors and stitch up the Sugar N Spice dress. 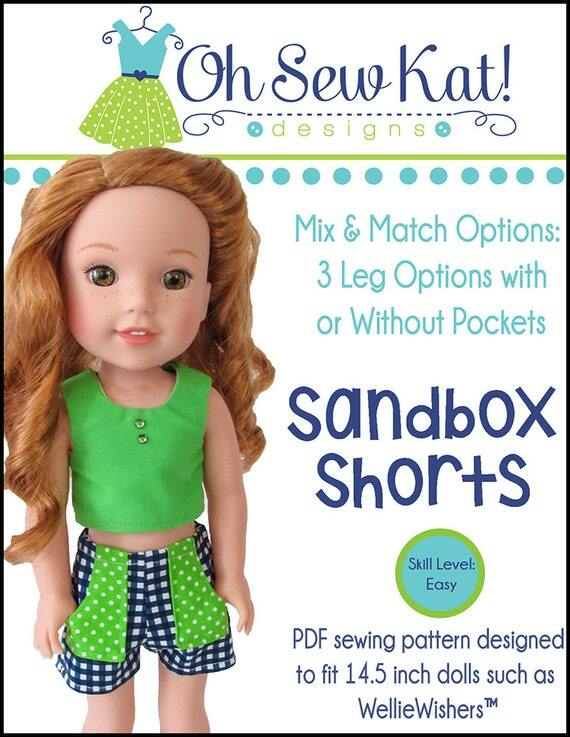 Use your specialty fabric for a cute overskirt- a skirt and waistband…so quick and easy! Don’t forget the rest of the accessories included in the Everything Nice pattern or the Bundle (18 inch size). Sugar n Spice and Everything Nice! Find the Sugar n Spice and Everything Nice Pattern for 16 inch Animators’ Dolls. 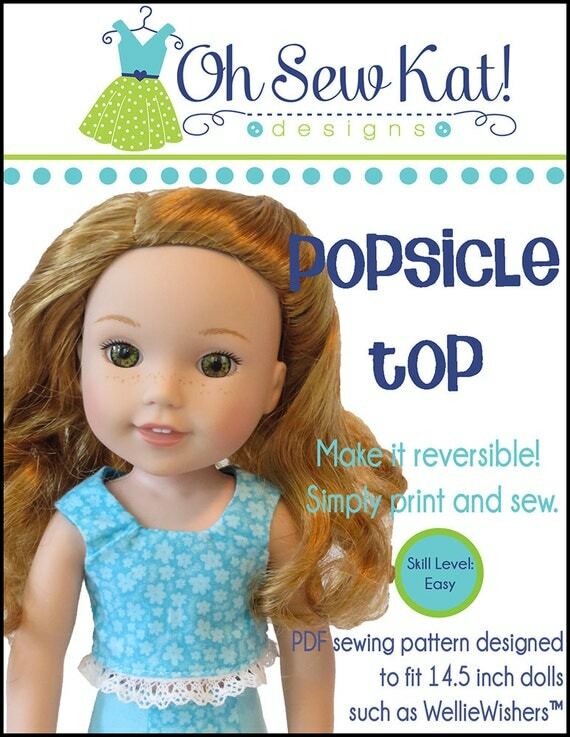 Step it Up Series: Sugar N Spice Peplum Top for Dolls – Easy Pattern Hack! Take your patterns to the next level when you step up the Sugar n Spice Dress to this cute, peplum top! This cute little top is easy to sew from the Sugar n Spice Dress pattern. Buy it in my Etsy shop. 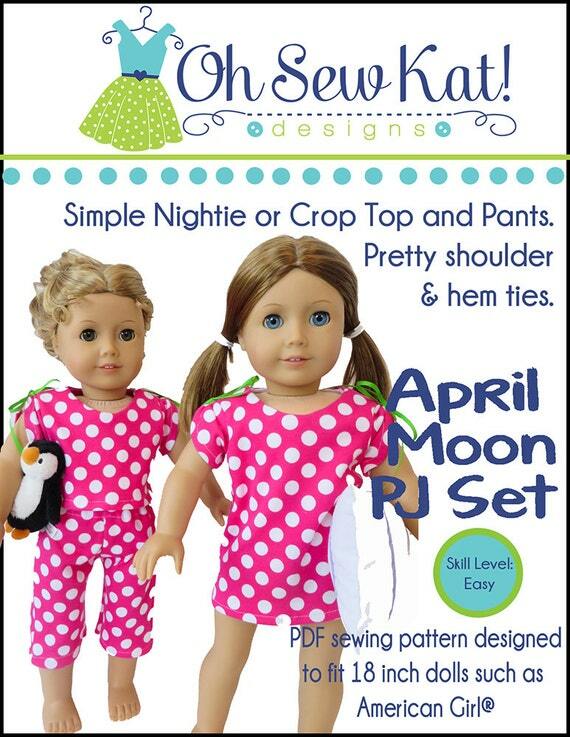 The pattern bundle also includes the dress up accessories! 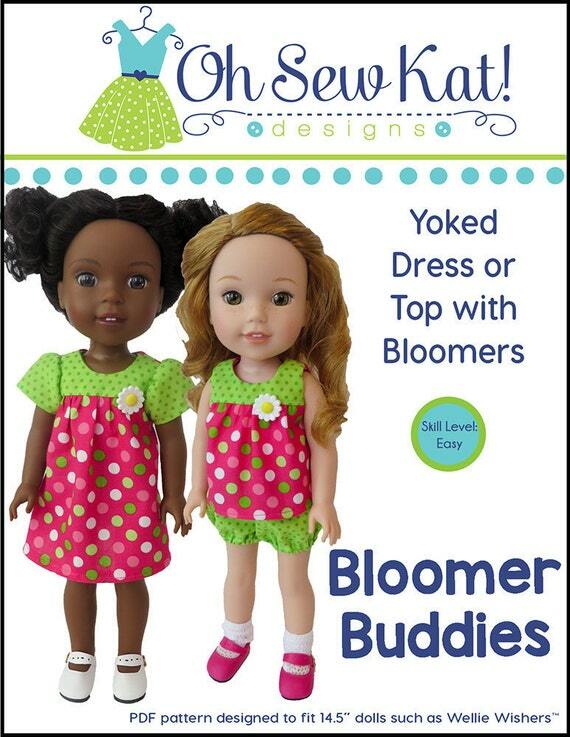 This pattern is also available sized for WellieWishers and Animators Dolls. Make your dress into a Peplum Top with this easy variation to the pattern. This tutorial assumes you have a basic knowledge of sewing. 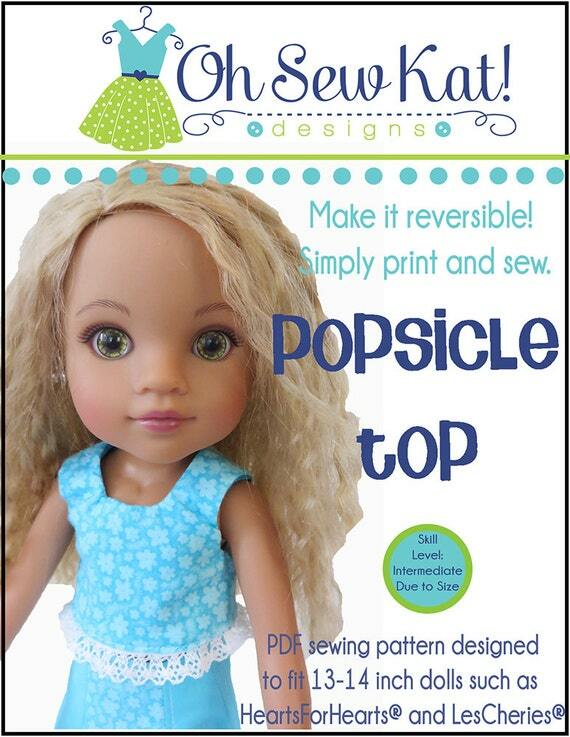 Please refer to the pattern instructions for more detail, as well as the pattern pieces. Cut out your pattern pieces and fabric for the bodice, lining, and sleeves. Add 1/2 to 3/4 inch to the bodice if you want the peplum to sit below the waist. Instead of a wide skirt piece, cut a shorter skirt piece as the peplum. For the 18 inch doll size, I used 2 1/4 inches by 28 inches. The longer your peplum, the fuller it will be. For the 14.5 inch Wellie Wishers dolls, I cut peplums at 2 1/2 by 15 inches (ladybug) and 1 3/4 inches by 17 inches (holly). Follow the pattern directions to make the top, using the peplum piece instead of the skirt piece. Enjoy these amazing photos by Pam Ray of Amy Violet’s, who made the cutest peplum tops for her Wellies and sells the outfits in her shop. 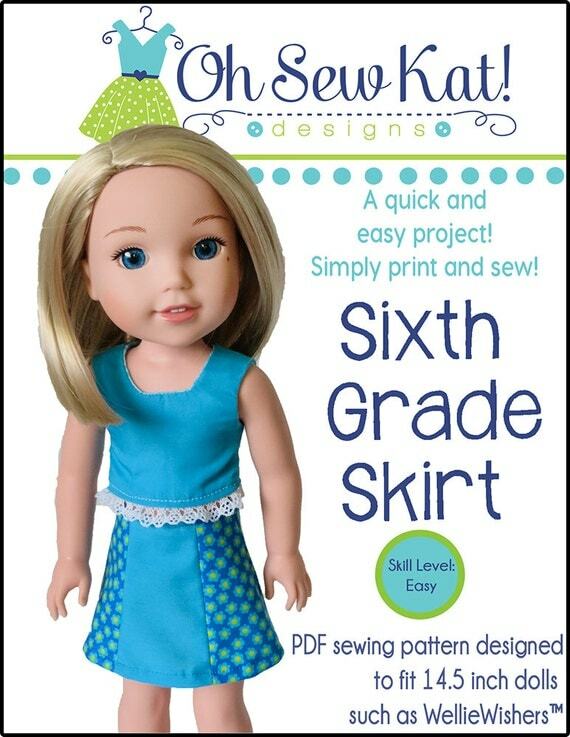 Each set is paired with a Sixth Grade Skirt, with the added pockets as shown in THIS TUTORIAL. She also used THIS TUTORIAL to add the front placket with a little lace! Nice touch! I just love to see how others stitch up the patterns I created. Have fun sewing up a cute top with Oh Sew Kat’s most popular (and versatile) dress pattern, Sugar n Spice and Everything Nice! See the Inspiration Gallery for even more ideas to use your pattern! Thanks for stopping by! Use the links below to share this tutorial with your friends! Sew something pink this month for breast cancer awareness! Everyone knows someone who has fought this battle. 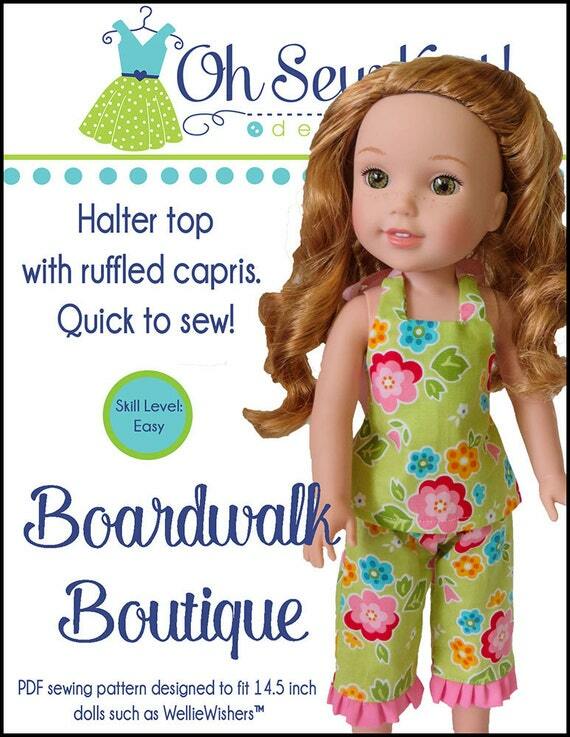 The Boardwalk Boutique Sewing Pattern and many other sewing patterns for doll that are 14-18 inches in my shop on on Etsy, Pixie Faire, YouCanMakeThis, and Craftsy.